Warm weather and calm seas this August have increased the amount of biological activity in the central Baltic Sea, with the Finnish algae monitoring service Alg@line reporting a dominance of cyanobacteria in the region at this time. The Baltic Sea faces many serious challenges, including toxic pollutants, deep-water oxygen deficiencies, and toxic blooms of cyanobacteria affecting the ecosystem, aquaculture and tourism. The situation was so bad that in 1974 the Helsinki Convention for the Protection of the Marine Environment of the Baltic Sea Area was created to improve the state of the sea. Since then, the health of the Baltic Sea has improved dramatically. Sentinel-2A was launched on 23 June, primarily to monitor land and vegetation for Europe's environmental monitoring Copernicus programme. This new satellite carries a high-resolution instrument that covers 13 spectral bands with a swath width of 290 km. This instrument is already exceeding expectations when it comes to monitoring the biology of coastal waters, as seen in these spectacular images of the central Baltic Sea taken on 7 August. 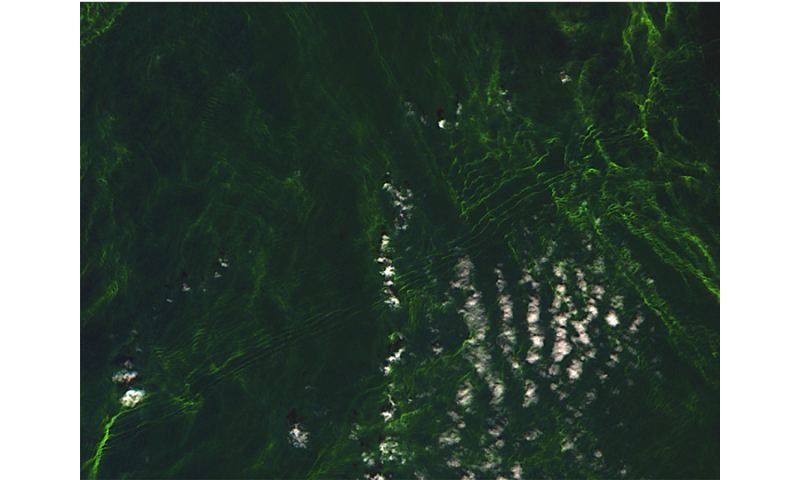 The images, showing detail down to 10 m across, reveal exquisite detail of an algal bloom. 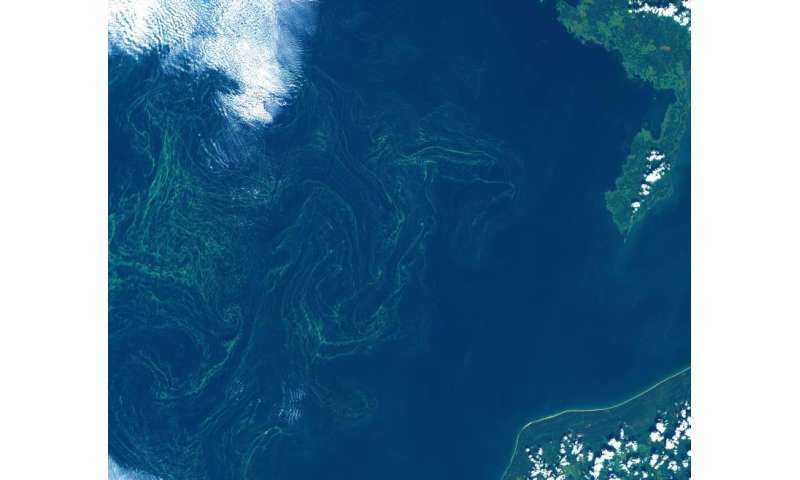 Blooms in the Baltic Sea usually appear as a green–yellow soup or a mass of blue–green threads along density gradients within the sea. The streaks and filaments, eddies and whirls of biological activity are clearly visible in these new images. Cyanobacteria have qualities similar to algae and thrive on phosphorus in the water. High water temperature and sunny, calm weather often lead to particularly large blooms that pose problems to the ecosystem and, therefore, aquaculture and tourism. Toxicity varies between different species, but can also vary within the same species. Because of this, several teams monitor the status of blooms in the region using ships. However, satellites can provide a synoptic view that ships alone cannot. Sentinel-2A's resolution of 10 m in multiple bands allows Copernicus services to monitor biological activity in the region. While it was optimised for land applications, it is clearly a valuable tool for monitoring ocean colour. A ship can even be seen in the top image heading into the 'eye' of this algal storm. The ship's track is visible as straight dark feature where the algae have been disturbed by turbulence created by the ship's propellers as it mixes water in its wake. Fine-scale filaments of biological activity reveal the vertical movement associated with ocean density fronts and dynamics. ESA ocean scientist Craig Donlon said, "Sentinel-2A multispectral imager data of biological activity are delivered at a much higher spatial resolution than current operational numerical ocean prediction systems. "This provides unique and complementary information to monitor the development of potentially harmful blooms. "To support safe aquaculture and tourism we need to have better knowledge of the ecosystem and physical dynamics in the upper ocean, which is expressed in the horizontal structures we can see in the Sentinel-2A imagery. 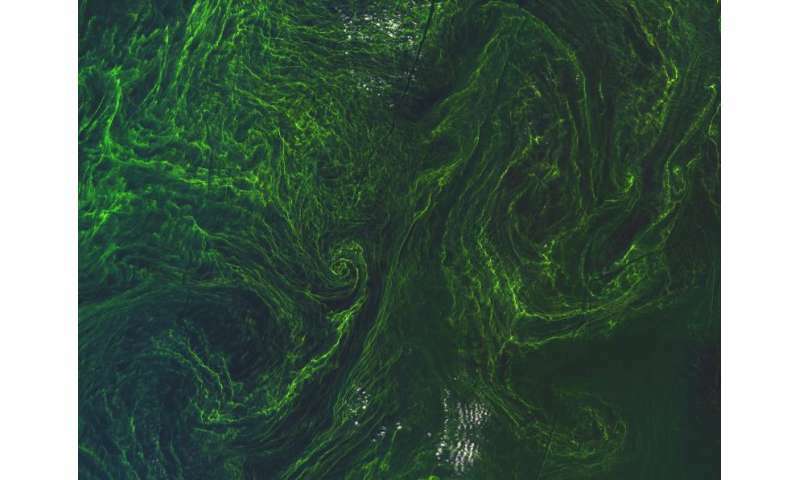 "For example, the linear features in the algal bloom signature across the image suggest that internal waves are present. As these waves propagate and break, they energise the upper layers of the water column mixing typically deeper oxygen-depleted waters and change the distribution of the bloom." Betrand Chapron, scientific leader of ESA's GlobCurrent project, added, "The challenge is to work with Sentinel-2 data in synergy with other satellite data. This includes data from Sentinel-1 and the upcoming Sentinel-3 missions to maximise our understanding of how the ecosystem develops and to provide warnings to decision-makers about harmful algal blooms. "The upper-ocean vertical activity revealed through the fine-scale horizontal structures seen in the fantastic Sentinel-2 images and understating how the multiple-scale interaction of different ocean processes relates to ocean currents and dynamics, is frontier science that underpins the operational Copernicus Marine Environmental Monitoring Service." Fabrice Collard from Oceandatalab said, "To help discover and analyse this synergy between Sentinel-1, -2 and -3 together with other satellite, in situ and model datasets, an Ocean Virtual Laboratory is under development. This will exploit the fantastic Sentinel-2 data as soon as the commissioning is done."